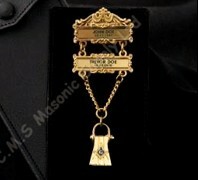 The Online Masonic Lewis Jewels, Regalia, Rings & Gift store! Masonic Supply Shop is a distributor of quality Lewis Jewels and other Masonic regalia and supplies at competitive prices, serving the Masonic fraternity. Please do not hesitate to contact us for either a quotation or assistance regarding your order or our products. The Lewis Jewel may be worn by a Mason, if at the time of his Initiation, his father was a Mason in good standing (the initiate of a deceased father in good standing at the time of his demise would also qualify). Whence is the name Lewis Jewel derived? We understand how difficult it is to find Lewis Jewels and other Masonic Supplies, Masonic Supply Shop is able to provide the best quality Masonic Regalia, Jewelery and Gifts at competitive prices.